Blackberry-maker Research in Motion (RIM) has seen its profits plunge, and reported the first fall in quarterly subscription numbers in the company's history. The Canadian firm made a net profit of $9m (£5.5m) in the three months to 1 December, down from $265m a year ago. During the quarter, its global subscriber base fell to 79 million from 80 million. 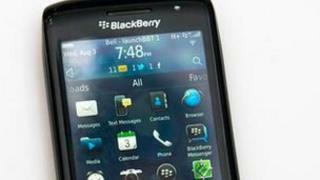 RIM hopes to revive its fortunes with a new operating system. The Blackberry 10 system will be introduced from 30 January on a new range of handsets. RIM's revenues for the quarter totalled $2.7bn, down 47% from a year earlier. The company has struggled in recent years to compete with the popular iPhone and Android handsets. Analysts said the results were broadly as expected, but that the fall in subscriber numbers was a concern. "The one troubling metric is their subscriber base - it came in at 79 million, so they actually lost subscribers this quarter," said Mark McKechnie, research analyst at Evercore Partners. "They've been able to offset losses in the US by gaining subscribers internationally, but it looks like this quarter they just weren't able to do that."